So often when we're in the midst of trial and overwhelmed, we don't know what to pray or how to pray sometimes. If we're honest, sometimes we just don't have the energy to pray even though we know it's what we really need to do. Even in the good times we don't pray as we should. We complicate things sometimes too thinking we have to have the "perfect" words when there really aren't perfect words and You just want us to be present with You and speak from transparently from the heart. As imperfect as we are we do desire to seek You in prayer but, we need Your help. I ask for Your help and I know that You'll provide it because You're faithful and true! Helps us to rely on Your Holy Spirit so we'll learn how to pray day-by-day as a first response and not a last response during the good and bad times. You teach us in Your Word that when our words fail, when we don't know how to pray that Your Holy Spirit intercedes for us! I praise You and thank You for Your help! I praise You for loving us so much that You minister to us through Your Holy Spirit in our weaknesses including our wordlessness or prayerlessness. Help us Father rely on Your Holy Spirit's strength in all things including prayer. Help us Father to remember that we don't have to have it all together we just need to be faithful to pray no matter what. You know our hearts...that is enough! 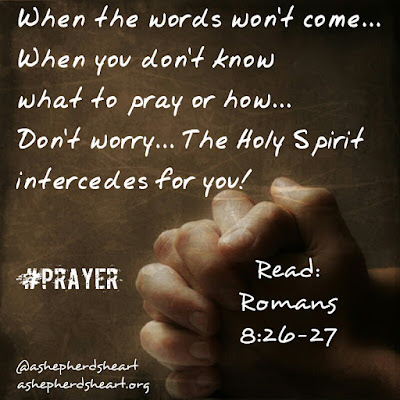 Help us to remember that again, when our words fail, when we don't know how to pray, that Your Holy Spirit it there with us and is interceding for us to Your great throne of Grace!